Lately, I have been in one of those moods that we all experience sooner or later, when I have country songs in Czech that keep playing in my head. Wanting to put a stop to this annoying feeling, I did what any thinking person would do, and looked for some Czech rock music to listen to instead. I looked for Jiri Schelinger, and found a soulful song about feeding pigeons called Holubi Dum. In the list of videos brought up in my search for Jiri Schelinger's music, I found a short documentary about Jiri Trnka, a man who I had never heard of. Wondering how a last name so exotically short of vowels was being discussed in English, I watched the documentary. It solved a mystery for me. Years ago I had a book of fables according to the French author La Fontaine that I unfortunately lost. The illustrations were of stellar quality, and exponentially increased the value of the book to me. 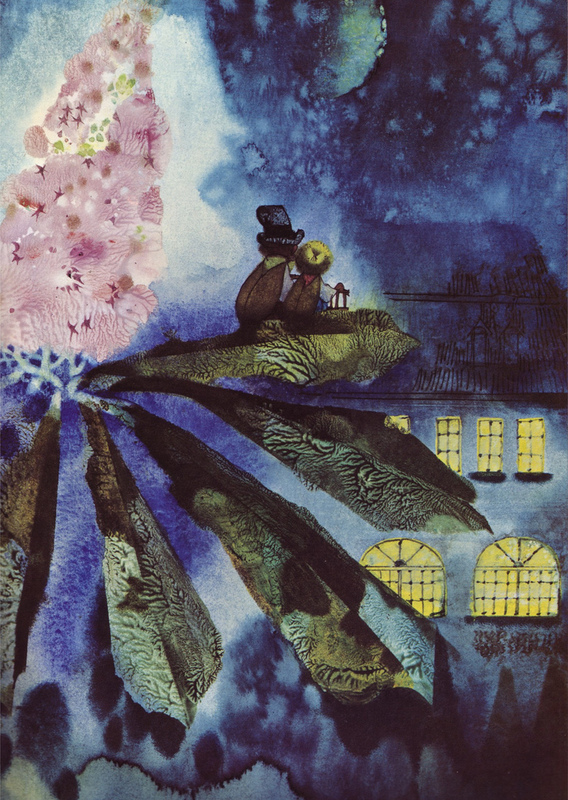 During the documentary, which had a second part,I found out that the La Fontaine collection of fables, as well as other children's books illustrated by Jiri Trnka are also readily available. The Czechs, to their credit have always taken animation and children's books seriously. Born in 1912, Trnka spent the war years designing stage sets and illustrating children's books. When the communists came to power, they subsidized his work, but did not interfere with his creative processes. Despite this, Trnka managed to produce an allegorical cartoon, "The Hand" about a simple potter who only wanted to make a flower pot and was chased by an ominous hand that ordered the potter to instead make a likeness of itself. The film was banned by the communist authorities, despite winning international acclaim. In 1969 after the chill following the Soviet invasion of Czechoslovakia in 1968, "The Hand" was banned by the communist authorities. In that year in December, Jiri Trnka passed away from heart problems. Despite having his film banned, Trnka was buried with state honours. Having "The Hand" banned was probably Trnka's greatest honour of all, a token of recognition that he struggled as an artist and a human being with the tension between conscience and artistic creativity under a totalitarian regime. From illustration to animated film making, Jiri Trnka made earth shaking contributions to art and entertainment. I am grateful for having discovered Trnka's life and work in the course of my musical wanderings through You Tube. I hope my readers will appreciate him as well. Here are parts 1 and 2 of "The Hand" I also recommend "The Cybernetic Grandma" which is described as follows on You Tube. Trnka's sci-fi "The Cybernetic Grandma" was a vision of the future in which machines and robots try to substitute themselves into the most beautiful human relationships. A cybernetic robot is supposed to substitute for the loving grandmother of a little girl. The wise grandmother, however, comes back and the girl finds the warmth of her grandmother's loving arms again. I feel priveleged to have discovered the life and work of Trnka. Jiri Trnka is the best artist. :) I still read the childrenbooks he illustrated.